The effect of oxygen content on NO removal and microbial communities of a hybrid catalytic membrane biofilm reactor (HCMBR) has been investigated. NO removal efficiency reached 84.8%, 85.1%, 94% and 94.5% at oxygen content of 2%, 6%, 10% and 17% in flue gas (H2, H6, H10 and H17), respectively. NO removal increased with increasing oxygen content. Denitrification was dominant in H2, H6; simultaneous nitrification and denitrification occurred in H10, H17. Oxygen content influenced the microbial community in HCMBR as shown by 16S rDNA, metagenomics sequencing method. The dominant phylum was Fluviicola, Arcobacter, Brachymonasin H2, H6, H10, while Brachymonas, denitrificans, vadinCA02 in H17. Fluviicola, Acrobacter, Brachymonas and Brachymonas were dominant denitrifiers in H2, H6, H10 and H17, respectively. Primary coordinate analysis (PcoA) indicated phylogenic structures in H10 and H17 were highly alike but dissimilar to those in H2 and H6. Canonical correlation analysis (CCA) classified visualized oxygen content dependence distinction of bacterial genera. Nitrogen oxides (NOx) are an important precursor of haze particles, acid rain, photochemical smog and tropospheric ozone depletion, which generated from fossil fuel combustion . China NOx emissions can reach 18.5 million tons in 2015 . Nitrogen oxides reduction through denitrification measures, such as selective catalytic reduction (SCR), selective non-catalytic reduction (SNCR), ozone oxidation and absorption . The drawbacks of SCR including high cost, high energy assumption, leakage of ammonia and catalysts poisoning had posed unprecedented challenges . Biotechnology is an effective technology for flue gas denitrification featured by cost-effectiveness, low consumption, no secondary pollution and simplicity in configuration. Bioprocesses for NOx removal can be classified into bio-scrubber, bio-trickling filter, membrane biofilm reactor and hybrid membrane catalytic biofilm reactor, the flue gas denitration has nitrification and denitrification . Membrane biofilm reactor offers large specific area for efficient mass transfer and biofilm colonization which is especially favorable for hydrophobic nitrogen oxides . A hollow-fiber membrane bioreactor was used for NO removal by nitrification/denitrification at temperatures between 20°C and 55°C . A hollow-fiber membrane bioreactor was stability and high efficiency for NO removal, NO removal efficiency and elimination capacity were inversely proportional to the inlet oxygen concentration . The denitrification was inhibited by the increase of oxygen concentration, nitrification/denitrification and the dynamics of key bacterial communities were highly influenced by the dissolved oxygen concentration concentration . NO removal efficiency in a bio-trickling filter significantly increased as oxygen content increased from 4% to 20% . Hybrid catalytic membrane bioreactor (HCMBR), intimate coupling of membrane catalysis and nitrification /denitrification, can significantly improve NO removal in flue gas . The oxygen content of flue gas in medium and small sized boiler, industries furnaces, power station boiler are different and changes. However, influence of oxygen content in flue gas on NO removal performance and microbial communities in HCMBR may be poorly understood. The objective of this work is to study the effect of oxygen content on nitric oxide removal performance and microbial community of a hybrid catalytic membrane biofilm reactor (HCMBR). The study evaluates the effect of oxygen content on nitrification/denitrification and membrane catalysis, and analyzes microbial diversity, bacterial community in HCMBR assessed by 16S rDNA and metagenomics sequencing method, which is believed to promote the application of the HCMBR. The experimental flow loop of N-TiO2/PSF hybrid catalytic membrane biofilm reactor used in the study was shown in our previous study . The influence of oxygen on nitrification/denitrification and microbial community of a hybrid catalytic membrane biofilm reactor (HCMBfR) were evaluated during the 120-d continuous running test under oxygen concentration of 2%, 6%, 10% and 17% (four distinct phases featured by H2, H6, H10 and H17) a waste gas mixture (NO, O2 and Ar) system. Bacterial community compositions and the gene function of bacterial in the hybrid catalytic membrane bioreactor were assessed by 16S rDNA and High-throughput sequencing method, and identify the colonies of the predominant microorganisms by the procedures of total DNA extraction, polymerase chain reaction (PCR) amplification of 16S rDNA, cloning and sequencing, calculation of similarity and diversity indexes, analysis of the successional route of the community. Sequencing libraries were generated by NEB Next® Ultra™ DNA Library Prep Kit for Illumina (NEB, USA) following manufacturer’s recommendations and index codes were added. Nonmetric multidimensional scaling (NMDS) analysis is a commonly used tool to compare the similarity and dissimilarity between two complex systems. Chimera was detected by UCHIME, and the resulting high quality sequences were processed to generate operational taxonomic units (OTUs) by CD-HIT at the 97% sequence similarity threshold. The taxonomic assignment was performed with the RDP classifier with a confidence cutoff of 0.5. Hierarchical clustering analysis was performed using CLUSTER and visualized using TREEVIEW, and other statistical analyses were performed with the IEG pipeline (http://ieg.ou.edu). The Testo350 flue gas analyzer (Testo AG, Germany) analysis device with a measurement accuracy of 1ppm was used for the analysis of nitric oxide concentration. Gas flow rates were measured using Model LZB-1 flow meters with units of 0.1 L min-1. Liquid flow rates were measured using Model LZB-1 flow meters with units of 0.1 mL min-1. The pH values were measured by a Model pHB-3 pH Tester with units of 0.1 (Sanxin Instrument Company, Shanghai, China). The dissolved oxygen concentration was measured by the YSI 550A Handheld Dissolved Oxygen Instrument with a field-replaceable YSI dissolved oxygen probe(YSI Environmental company, The United States). Figure 1 showed the effect of oxygen content on nitric oxide removal performance of the HCMBR during 120-d continuous running test under the conditions of sprinkling amount of 45 mL min-1, NO inlet concentration of 133.9 mg m-3, gas residence time (GRT) of 8.3 sec at normal temperature. Four distinct phases were observed by oxygen concentration of 2%, 6%, 10% and 17% (designated as H2, H6, H10 and H17). In low oxygen conditions (H2), NO removal efficiency (RE) gradually increased from 64.5% to 69.1% from 1st day to 3rd day. Afterwards, from 4th day to 9th day, RE maintained at 67.6%-69.4%. During the first 9 days, RE fluctuation was about 5.0% and average RE was 67.9%. After 3 days’ sharp increase, RE became more stable in the following 6 days suggesting far better microbial acclimatization. RE increased from 71.9% to 75.4% from days 10 to 21, further from 80.6% to 85.6% from days 22 to 30. This indicated biofilm formation upon hollow fiber membrane surface was progressively underway and a stable microbial community structure formed gradually. But the newly-formed biofilm might block visible light and weakened NO catalytic removal performance. Thus, as NO biological removal performance enhanced, NO catalytic removal performance might decline. High NO removal performance might still be attributed to joint contribution of catalysis and biodegradation. At low O2 content, denitrification might be the metabolic pathway for NO removal. When O2 content in flue gas was increased to 6%, NO removal efficiency suddenly declined to 80.2% at 31st day. RE gradually increased from 80.2 % to 84.5 % from 31st day to 36th day. RE changed from 78.4% to 85.3% from 37th day to 52nd day. RE fluctuated in the range of 77.7%-82.1% from 53rd day to 60th day with an average of 80.2%. Despite frequent fluctuation of RE, the average RE was relatively high (81.0%). When O2 content was further elevated to 10%, RE suddenly increased to 86.3% on 61st day. RE fluctuated in the range of 87.3% ± 2.0% from 61st day to 72nd day. NO removal performance achieved further improvement with O2 content increasing. RE suddenly increased to 92.0% on 73rd day and henceforth RE slightly fluctuated within the range of 91.7% ± 1.0% until 81st day. RE underwent an undulant decrease from 86.8% to 81.1% from 82nd day to 90th day. NO removal performance decline was possibly due to catalyst deactivation after long-term operation. RE in H10 was much higher than that in H6. When O2 content was further increased to 17%, RE increased from 81.0% to 85.2% from 91st day to 92nd day. RE slightly fluctuated within in the range of 84.9% ± 1.8% from 92nd day to 122nd day. This was probably attributed to oxygen and nitrate co-respiration thereby aerobic denitrifiers sustainably grew in aerobic environment . 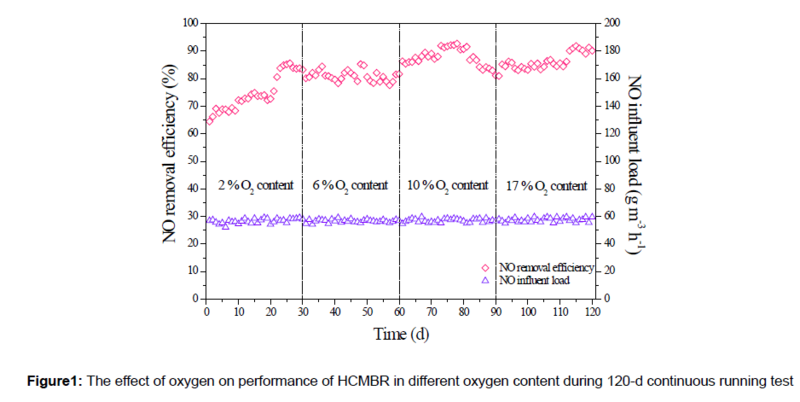 HCMBR at 17% O2 content exhibited far more remarkable NO removal performance. NO removal performance improved and achieved stability gradually in different O2 content. NO removal efficiency reached 84.8%, 85.1%, 94% and 94.5% in H2, H6, H10 and H17, respectively; and elimination capabilities (EC) were up to 50.1, 50.3, 55.5, 55.8 g m-3 h-1, respectively. O2 content elevation led to higher NO removal, which was attributed to aerobic denitrification, heterotrophic nitrification and catalytic oxidation. Catalytic of nitric oxide could further improve NO removal performance and alleviate membrane fouling . Continuous running strengthened microbial acclimatization and adaptability leading to further improvement of NO removal. The effect of oxygen content on catalysis and biodegradation was shown in Figure 2 under the conditions of sprinkling amount of 45 mL min-1, NO inlet load of 133.9 mg m-3, gas residence time (GRT) of 8.3 sec, oxygen content of 2%, 6%, 10%, 17% respectively. The catalytic reaction rate was 0.62, 1.19, 0.17, and 0.46 mg m-2 h-1, the biochemical degradation rate was 1.08, 1.36, 1.89 and 2.86 mg m-2 h-1 with different oxygen contents of 2%, 6%, 10%, 17% respectively. The amount of membrane catalytic denitrification was 0.53, 1.0, 0.15 and 0.4 mg h-1; the amount of biochemical denitrification was 1.02, 1.17, 1.63 and 2.46 mg h-1 at oxygen content of 2%, 6% ,10%, 17% in the HCMBR, separately. For comparison, higher oxygen content, the faster the biochemical degradation rate, the greater the amount of biochemical denitration, biochemical denitrification capability of HCMBR in H17, H10, H6 were 2.41, 1.6, 1.15 times of that in H2, respectively. It can be concluded that nitrification and denitrification was accelerated with increasing oxygen content in flue gas. The catalytic denitrification capability was generally in the order: H10<H17<H2<H6. The possible reason for this was that the biofilm coverage increased at the catalytic layer with increasing oxygen content, resulting in decline of photocatalytic efficiency. The microbial diversity in the HCMBR in different oxygen content (H2, H6, H10 and H17) was assessed by 16S rDNA sequencing test. Sequences number in H2 was the highest (208199), followed by that in H17 (110571). Sequences numbers in H6 and H10 were 22105 and 29570, respectively, far lower than those in H17 and H2. Operational taxonomic unit (OTUs) number in H17 turned out to be the highest (765), followed by that in H6 (545). OTUs numbers in H10 and H2 were 488 and 385, respectively. Thus, microbial diversity in H17 was the highest, microbial diversity in H2 was the lowest. Chao 1 index was the theoretical estimate of OTUs number. Numerical order of Chao 1 indices conformed to that of OTUs numbers. Thus Chao 1 indices further confirmed degree of microbial diversity in each sample. Shannon index quantified evenness of microbial community. Shannon index in H17 was the highest (4.70) indicating highest evenness in sequences assignment, in another word, sequences number per OTU was the highest in H17. Shannon index of H2 was the lowest (4.24), thus microbial evenness in H2 was the lowest. Simpson index in H6 was the highest (0.938), while that in H17 was the lowest (0.865).Thus, microbial community in H6 showed both better evenness and richness. Especially, number of observed species in H6 (545) was equivalent to its OTU number (545). But number of observed species in the other samples deviated from their OTUs numbers. PD whole tree indices in 4 samples also followed accordant numerical trend to their OTUs numbers. Similarity of each sample was visualized by means of principal coordinates analysis (PcoA) (Figure 3a). Approximately 95.16% systematic informational variation was explained by the first principal coordinate (PC1: 59.58%) and the second principal coordinate (PC2: 35.58%). According to distances between scatters, 4 samples can be classified into 3 groups: (1) H2; (2) H6; (3) H10 and H17. H2 deviated from the other 2 groups suggesting phylogenetic structure at 2% O2 content was hugely different from those in the other 2 groups. H6 also showed considerable spatial deviation from the other 2 groups suggesting phylogenetic structure at 6% O2 content was also greatly dissimilar to those in the other 2 groups. H10 and H17 were closely clustered but deviated from the other 2 groups suggesting phylogenetic structures at 10% and 17% O2 content were similar but different from those in the other 2 groups. This grouping indicated phylogenetic structure underwent 3 levels of microbial structural shift in response to oxygen content variation. The influence of oxygen content on microbial community was shown by canonical correlation analysis (CCA) (Figure 3b). The result was visualized in a two-dimensional graph explaining 71.6% systematic information (Axis 1: 34.1%; Axis 2: 37.5%).The distances between the genera points in the diagram represented their similarity in relative abundance distribution across 4 samples. More precisely, shorter distance between 2 genera points indicated their relative abundance distribution underwent similar trend in response to O2 content variation and they frequently occurred together. Based on these principles, the bacterial genera were classified into 6 groups. O2 content arrow pointed in the direction of sharpest numerical increase. The specie points could be projected perpendicularly onto the line overlaying the O2 content arrow. These projections can be used to approximate the optimal O2 content for each genus. O2 content arrow also pointed the increasing direction of optima for projection point of each genus. Optimal O2 content for vadinCA02 was the highest while that for Xanthobacter was the lowest. Genus with higher optimal O2 content suggested it was more O2 dependent. Thus, top 5 O2 dependent genera were vadinCA02, Brachymonas, HA73, Comamonadaceae(f) and BA008(f) whereas the last 5 O2 dependent genera were Xanthobacter, Brevundimonas, Fluviicola, Citrobacter and Arcobacter. In summary, PcoA indicated O2 content variation caused 3 levels of phylogenetic shift to the microbial community. Clustering result revealed genera undergoing similar relative abundance variationacross 4 samples. CCA implied the phylogenetic shift was due to languish and flourish of different O2 dependent genera. When O2 content approximated optimum for a specific genus, this genus thrived and vice versa. The clustering of 19 dominant bacteria genera ≥ 1% in different oxygen content was shown in Figure 4. Clustering of 4 samples was consistent with grouping in PcoA result. H17 and H10 were clustered together due to similar phylogenetic structure and further grouped with H6, whereas phylogenetic structure in H2 was distinct from the other 2 groups. Bacterial genera of similar relative abundance in 4 samples were clustered together, suggesting O2 content variation wielded similar influence on their bacterial growth. The clustering result was consistent with analysis by16S rDNA sequencing. PcoA indicated O2 content variation caused 3 levels of phylogenetic shift to the microbial community. Clustering result revealed genera undergoing similar relative abundance variation across 4 samples. CCA implied the phylogenetic shift was due to languish and flourish of different O2 dependent genera. At phylum level, the relative abundances of dominant bacteria Bacteroidetesand Proteobacteria of H2, H6, H10 and H17 were in the change of 53.78%, 44.52%, 37.12%, to 34.08%; and 36.22%,31.93%, 4.24%, to 40.03% respectively (Figure 5a). Dominance in H2, was chemoheterotrophic anaerobic digester and fermented glucose to acetate, ethanol and lactate. Besides, Synergistetes (9.15%) was another subdominant phylum in H17. Synergistetes increased in abundance as O2 content increased. Synergistetes usually dominated microbial phylum in anaerobic sludge and was capable of amino acid degradation . Euryarchaeota was only subdominant phylum in H6. Hydrogenotrophic and acetoclastic methanogens in anaerobic digester belonged to Euryarchaeota . The relative abundances of Fluviicola, Porphyromonadaceae(f), and Acinetobacter decreased with the increase of oxygen content at genus level. Fluviicola was the dominant genus in H2, its relative abundance was 27.82%, decreased to less than 0.1% in H6, H10 and H17 (Figure 5b). Fluviicola was aerobic denitrifying species . The relative abundance of Porphyromonadaceae(f) was 18.36% in H2, decreased to 4.10%, 2.32% and 5.60% in H6, H10 and H17, respectively. Genus within Porphyromonadaceae family was strictly anaerobic and related to butyric acid production . The relative abundanceof Acinetobacterwas 7.59% in H2, decreased to 1.96%, 0.38% and 0.20% in H6, H10 and H17 respectively. Acinetobacter was also aerobic denitrifier . The dominant bacteria genus in H2 such as Xanthobacter, Citrobacter, Brevundimonas, Sedimentibacter, Sphingobacterium, Dysgonomonas and Devosia, theirs relative abundance was the highest in four oxygen levels. The relative abundanceof Xanthobacter was 4.64% in H2, but 0.02% in H6 and even zero in H10 and H17. Xanthobacterwas microaerophilic and conducted dissimilatory denitrification . The relative abundance of Citrobacter was 8.42% in H2, but less than 0.2% in H6, H10 and H17.Citrobacter performed citrate fermentation and aerobic denitrification . The relative abundanceof Brevundimonas was 7.07% in H2, but less than 0.1% in the other samples. Brevundimonas was antibiotic resistant and denitrifying genus . The abundance of Sedimentibacter was 3.97% in H2, 1.27% in H6 and 1.89% in H10, slightly increased to 4.98% in H17. Sedimentibacter was related to anaerobic hydrolysis of amino acids . The relative abundance of Sphingobacterium was 3.21% in H2, but zero in H6 and less than 0.01% in H10 and H17. Sphingobacteriumwas able to reduce nitrate to N2 . The relative abundance of Dysgonomonas was 3.13% in H2 but less than 0.01% in the other samples. This genus was correlated with anaerobic saccharide fermentation . The relative abundance of Devosia was 1.57% in H2 but less than 0.1% average in the other samples. Devosiacould reduce nitrate and carried nirK gene . The dominant bacteria genus in H6 such as Bacteroidales, Arcobacterand Paludibacter, theirs relative abundance was the highest in four oxygen levels. Bacteroidales was the dominant genus in H6, its relative abundances was 20.57% in H6, 5.65% in H10 and 5.70% and H17, but only 0.045% in H2. The relative abundanceof Arcobacter was 18.10% in H6, its abundance downshifted to 4.32% in H10, 0.05% in H17 and even zero in H2, suggesting it was also microaerophilic, growth properly in 6% O2 content. Arcobactercould carry out both nitrification and denitrification [26,27]. The relative abundancesof Methanobrevibacter are zero, 4.06%, 1.34%, and 0.21% in H6, H10, H2 and H17. This genus was hydrogenotrophic methanogen and related to nitrogen fixation .Other genera of 1.0%-4.0% relative abundance in H6 included PL-11B10(o) (3.48%), Blvii28 (2.23%), Sphaerochaeta (2.02%) , Beijerinckiaceae(f) (1.95%), Corynebacterium (1.42%), Alcaligenaceae(f) (1.33%), HA73 (1.32%) and vadinCA11 (1.02%). Sphaerochaeta and VadinCA11 were associated with anaerobic fermentation . Beijerinckiaceaewas a distinct family consisted of proteobacterial aerobic methanotrophs . Corynebacterium was facultative anaerobe and could perform nitrate reduction . Clones of nosZ and nirK genes had beenaffiliated to Alcaligenaceae suggesting denitrifying ability of this family, HA73 was able to hydrolyze amino acid and produce acetic acid . The dominant bacteria genus in H10 such as Paludibacter, Methanobrevibacter and Brachymonas, theirs relative abundance was the highest in four oxygen levels. Paludibacterwas strictly anaerobic and related to propionate and acetate production . Brachymonaswas an aerobic denitrifiers. The genera of relative abundance over 1.0% in H10 included BA008(f) (7.90%), Bacteroidales(o1) (5.65%), Alcaligenaceae(f) (3.57%), Arcobacter (4.32%), Comamonadaceae(f) (3.09%), Porphyromonadaceae(f) (2.32%), Sedimentibacter (1.82%), PL-11B10(o) (1.47%) and Methanobrevibacter (1.34%).The unmentioned genera of relative abundance over 1.0% in H10 included Clostridiales(o) (3.83%), ZB2(c) (1.72%), GZKB119(f) (1.32%), Rhodocyclaceae(f) (3.06%), vadinCA02 (1.42%) and Anaerovorax (1.21%). Clostridialeswas mesophilic anaerobic digester and able to degrade cellulose . ZB2 was often detected in aerobic biofilm samples and capable of complex carbon degradation . Rhodocyclaceae was denitrifiers , could degrade polycaprolactone . VadinCA02 degraded protein and produced acetic acid . Anaerovorax was obligate anaerobic chemoorganotrophic fermentative genus . The relative abundances of dominant bacteria Brachymonas, BA008(f), vadinCA02, Bacteroidales(o1) and Porphyromonadaceae(f) in H17 were 33.02%, 13.31%, 6.87%, 5.7% and 5.60% respectively. The relative abundances of Brachymonas were 3.71%, 26.67%, 33.02% in H6, H10 and H17 separately. Brachymonas boomed as O2 content increased. Brachymonaswas a chemoorganotrophic denitrifier [22,27], suggesting denitrification dominated nitrogen metabolism in H17. NO removal at 17% O2 content could be largely attributed to aerobic denitrification. The other genera of relative abundance over 1.0% in H17 included Sedimentibacter (4.98%), Paludibacter (3.29%), HA73 (2.28%), T78 (2.21%), Bacteroidales(o2) (1.94%), Clostridiales(o) (1.53%), GZKB119 (1.33%) and Comamonadaceae(f) (1.09%). Oxygen content greatly affected microbial community and shifted phylogenetic structure dramatically as O2 content increasing from 2% to 17%. Some genera, such as Brachymonas, BA008(f), VadinCA02, Bacteroidales(o2)and GZKB119, increased in abundance, whereas others, such as Acinetobacterand Devosia, decreased with oxygen content increased from 2% to 17%. For comparison, the dominant microbial community structure changed, ten dominant genera of H2 included Porphyromonadaceae(f), Alcaligenaceae(f), Acinetobacter,Citrobacter, Fluviicola, Brevundimonas, Sphingobacterium, Devosia, Dysgonomonas and Xanthobacter; ten dominant genera of H6 included Bacteroidales(o), HA73, PL-11B10(o), Blvii28, vadinCA11, Methanobrevibacter, Sphaerochaeta, Beijerinckiaceae(f), Corynebacterium and Arcobacter; ten dominant genera of H10 included Paludibacter, Clostridiales(o), Comamonadaceae(f), Anaerovorax, ZB2(c) and Rhodocyclaceae(f); ten dominant genera of H17 included Brachymonas, BA008(f), VadinCA02, Sedimentibacter, HA73, T78, Bacteroidales(o) and GZKB119. The paper revealed that NO removal efficiency increased with increasing oxygen concentration. NO removal efficiency reached 84.8%, 85.1%, 94% and 94.5% under oxygen content of 2%, 6%, 10% and 17% in HCMBR, respectively. Denitrification was dominant in H2, H6; simultaneous nitrification and denitrification occurred in H10, H17. Oxygen affected the microbial community. The dominant phylum was Fluviicola, Arcobacter, Brachymonasin H2, H6, H10, while Brachymonas, denitrificans, vadinCA02 in H17. Fluviicola, Acrobacter, Brachymonas and Brachymonas were dominant denitrifiers in H2, H6, H10 and H17, respectively. Primary coordinate analysis (PcoA) indicated phylogenic structures in H10 and H17 were highly alike but dissimilar to those in H2 and H6. Canonical correlation analysis (CCA) classified visualized O2 dependence distinction of bacterial genera. The authors gratefully acknowledge the financial support from the Nation Nature Scientific Research Foundation of China (21377171, 21677178). Li PW, et al. An experimental study of the effect of nitrogen origin on the formation and reduction of NOx in fluidized-bed combustion. Energy. 2018;154:319-327. JF Wang, et al. Investigating the driving forces of NOx generation from energy consumption in China. Journal of Cleaner Production. 2018;184:836-846. Kawakami K and Ogura M. Theoretical investigation of novel two-step decomposition of nitric oxide over Fe(II) ion-exchanged zeolites using DFT calculations. Catal Today. 2015;242:343-350. Adewuyi YG, et al. Simultaneous removal of NO and SO2 from flue gas by combined heat and Fe2+ activated aqueous persulfate solutions. Chemosphere. 2018;193:1216-1225. Wei ZS, et al. Effect of gaseous mercury on nitric oxide removal performance and microbial community of a hybrid catalytic membrane biofilm reactor. Chemical Engineering Journal. 2017;316:584-591. Kumar A, et al. Membrane-based biological waste gas treatment. Chem Eng J. 2008;136:82-91. Min KN, et al. Hollow-fiber membrane bioreactor for nitric oxide removal. Environ Eng Sci. 2002;19:575-583. Zhang XY, et al. Removal of nitric oxide from simulated flue gas via denitrification in a hollow-fiber membrane bioreactor. J Environ Sci. 2013;25:2239-2246. Wang J, et al. Evaluation of the impact of dissolved oxygen concentration on biofilm microbial community in sequencing batch biofilm reactor. Journal of Bioscience and Bioengineering. 2018;125:532-542. Zhou H, et al. Effect of temperature downshifts on a bench-scale hybrid A/O system: Process performance and microbial community dynamics. Chemosphere. 2016;153:500-507. Zhang W, et al. Membrane fouling in photocatalytic membrane reactors (PMRs) for water and wastewater treatment: A critical review. Chemical Engineering Journal. 2016;302:446-458. Guo J, et al. Unraveling microbial structure and diversity of activated sludge in a full-scale simultaneous nitrogen and phosphorus removal plant using metagenomic sequencing. Enzyme and Microbial Technology. 2017;102:16-25. Huang X, et al. Illumina MiSeq investigations on the changes of microbial community in the Fusarium oxysporum f.sp. cubense infected soil during and after reductive soil disinfestation. Microbiological Research. 2015;181:33-42. Liu Y, et al. Short chain fatty acids accumulation and microbial community succession during ultrasonic-pretreated sludge anaerobic fermentation process: Effect of alkaline adjustment. International Biodeterioration & Biodegradation. 2014;94:128-133. Wang Z, et al. Abundance and Diversity of Bacterial Nitrifiers and Denitrifiers and Their Functional Genes in Tannery Wastewater Treatment Plants Revealed by High-Throughput Sequencing. PLoS One. 2014;9:e113603. Antwi P, et al. Functional bacterial and archaeal diversity revealed by 16S rRNA gene pyrosequencing during potato starch processing wastewater treatment in an UASB. Bioresource Technology. 2017;235:348-357. Cheng C, et al. Bar-Coded Pyrosequencing Reveals the Bacterial Community during Microcystis water Bloom in Guanting Reservoir, Beijing. Procedia Engineering. 2011;18:341-346. Lin L, et al. Effect of alkaline treatment pattern on anaerobic fermentation of swine manure. Process Biochemistry. 2015;50:1710-1717. Wang Y, et al. Effect of temperature downshifts on biological nitrogen removal and community structure of a lab-scale aerobic denitrification process. Biochemical Engineering Journal. 2015;101:200-208. Sáez F, et al. Growth and denitrifying activity of Xanthobacter autotrophicus CECT 7064 in the presence of selected pesticides. Applied Microbiology and Biotechnology. 2006;71:563-567. Alzate Marin JC, et al. Nitrification and aerobic denitrification in anoxic–aerobic sequencing batch reactor. Bioresource Technology. 2016;200:380-387. Wang J and Chu L. Biological nitrate removal from water and wastewater by solid-phase denitrification process. Biotechnology Advances. 2016;34:1103-1112. Viviantira C, et al. Enhanced denitrification at biocathode facilitated with biohydrogen production in a three-chambered bioelectrochemical system (BES) reactor. Chemical Engineering Journal. 2017;312:360-366. Viviantira E, et al. Denitrifying sulfide removal with methanogenic culture. Journal of the Taiwan Institute of Chemical Engineers. 2012;43:374-385. Feng L, et al. Comparison of nitrogen removal and microbial properties in solid-phase denitrification systems for water purification with various pretreated lignocellulosic carriers. Bioresource Technology. 2017;224:236-245. Wang J, et al. Bacterial community structure in simultaneous nitrification, denitrification and organic matter removal process treating saline mustard tuber wastewater as revealed by 16S rRNA sequencing. Bioresource Technology. 2017;228:31-38. Felföldi T, et al. Texture and type of polymer fiber carrier determine bacterial colonization and biofilm properties in wastewater treatment. Chemical Engineering Journal. 2015;264:824-834. McLellan SL, et al. Diversity and population structure of sewage-derived microorganisms in wastewater treatment plant influent. Environmental Microbiology. 2010;12:378-392. Li Y, et al. Enhancement of sludge granulation in anaerobic acetogenesis by addition of nitrate and microbial community analysis. Biochemical Engineering Journal. 2015;95:104-111. Zhu J, et al. Microbiology and potential applications of aerobic methane oxidation coupled to denitrification (AME-D) process: A review. Water Research. 2016;90:203-215. Xafenias N, et al. Cathodes enhance Corynebacterium glutamicum growth with nitrate and promote acetate and formate production. Bioresource Technology. 2016;216:105-113. Guo G, et al. Effect of pyrene on denitrification activity and abundance and composition of denitrifying community in an agricultural soil. Environmental Pollution. 2011;159:1886-1895. Qiu Y, et al. Paludibacter jiangxiensis sp. nov., a strictly anaerobic, propionate-producing bacterium isolated from rice paddy field. Archives of Microbiology. 2014;196:149-155. Kalyani DC, et al. Biofuel production from birch wood by combining high solid loading simultaneous saccharification and fermentation and anaerobic digestion. Applied Energy. 2017;193:210-219. Lv L, et al. Microbial community composition and function in a pilot-scale anaerobic-anoxic-aerobic combined process for the treatment of traditional Chinese medicine wastewater. Bioresource Technology. 2017;240:84-93. Cui B, et al. Achieving partial denitrification through control of biofilm structure during biofilm growth in denitrifying biofilter. Bioresource Technology. 2017;238:223-231. Yin Q, et al. Enhancing electron transfer by ferroferric oxide during the anaerobic treatment of synthetic wastewater with mixed organic carbon. International Biodeterioration & Biodegradation. 2017;119:104-110.